I’m very excited to be sharing my first recipe review from Gooseberry Patch‘s latest cookbook, Big Book of Homecooking. This recipe caught my attention right away. I’m a Virginia gal, and let’s just say, we love our piggy around here. So when I saw that this was also a casserole, I knew I had to try it. We thoroughly enjoyed this meal. Even my husband, our family’s picky eater, really enjoyed it. This is definitely a great meal for all the meat and potato lovers in your life. It was pure comfort food; filling and satisfying and I just served it up with some fried apples and my easy and homemade cream biscuits and it was delicious. I added my additions to the recipe in parentheses and I also added some notes below. Preheat oven to 375F degrees. Preheat a large skillet over medium-high heat, add in oil, then add in pork chops and brown pork chops on both sides in hot oil. (I seasoned my chops with a bit of salt, pepper and garlic powder). Set aside. 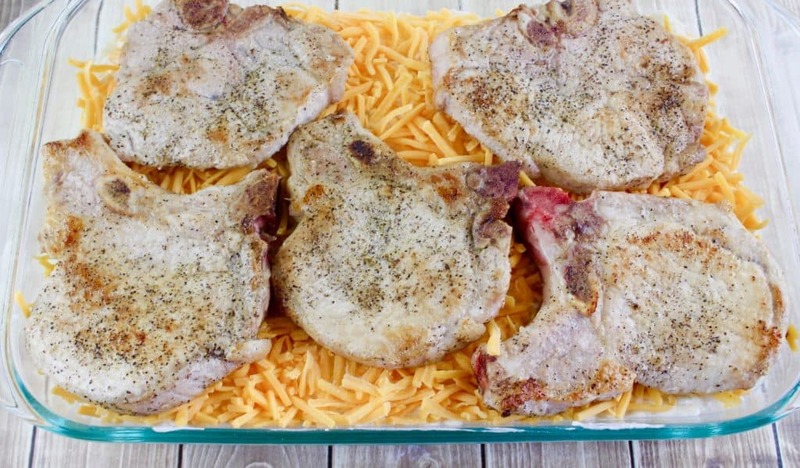 Be sure not to cook pork chops all the way through, they will finish cooking in the oven. 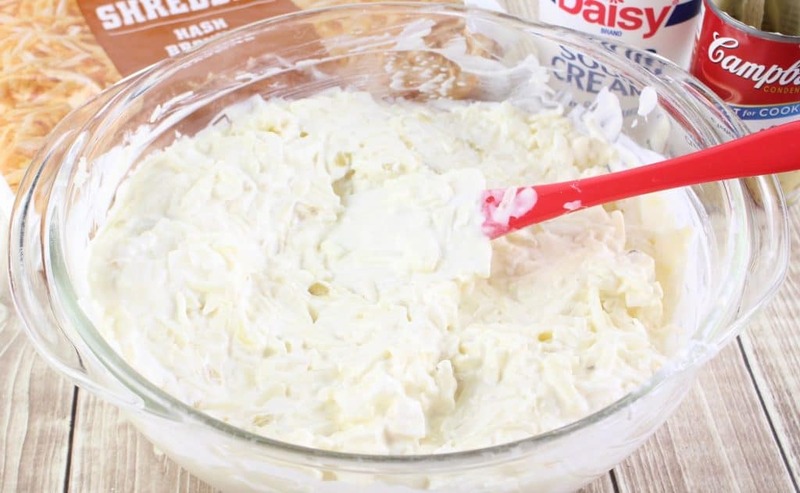 In a large bowl, combine sour cream, soup and milk. Stir in hashbrowns and onion. 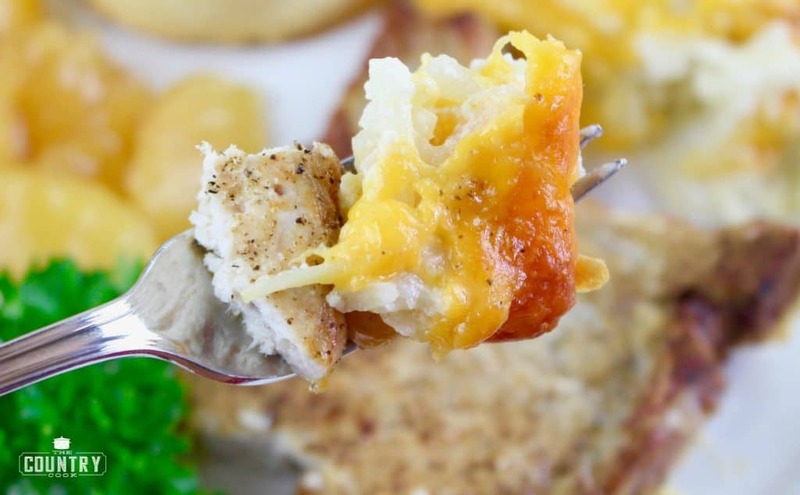 Spread hashbrown mixture in an ungreased 13×9 baking dish and sprinkle with cheese. Bake uncovered for 45-50 minutes or until heated through and pork chops are fully cooked. Cook’s Notes: The directions did not call for any kind of seasoning for the chops. I added a bit of salt, pepper and garlic powder to them. I think this really helped the flavor. But you could add any of your favorite seasoning to them or none at all, if you prefer. Also, I only had room for 4 pork chops in my casserole dish instead of the 5 pork chops the recipe called for since mine were on the large side. 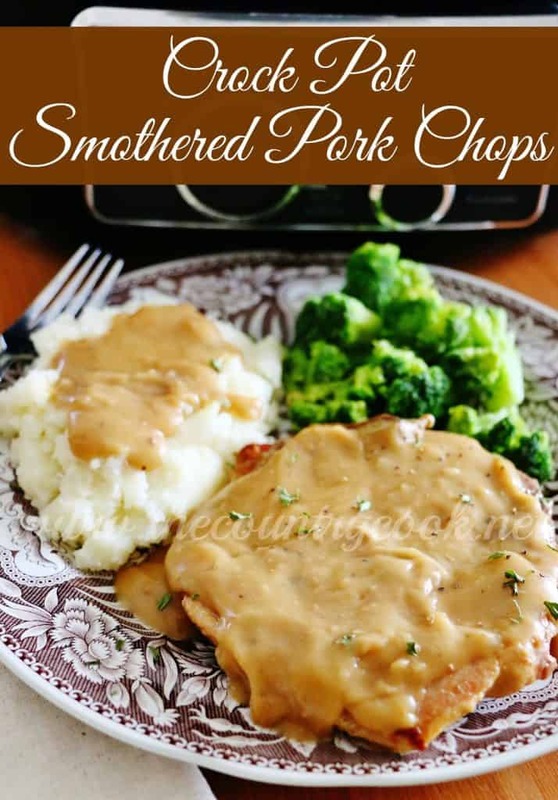 I would not recommend using thin cut pork chops for this recipe since the longer baking time may cause them to become dry. Season both sides of pork chops with salt & freshly ground black pepper and a little garlic powder. 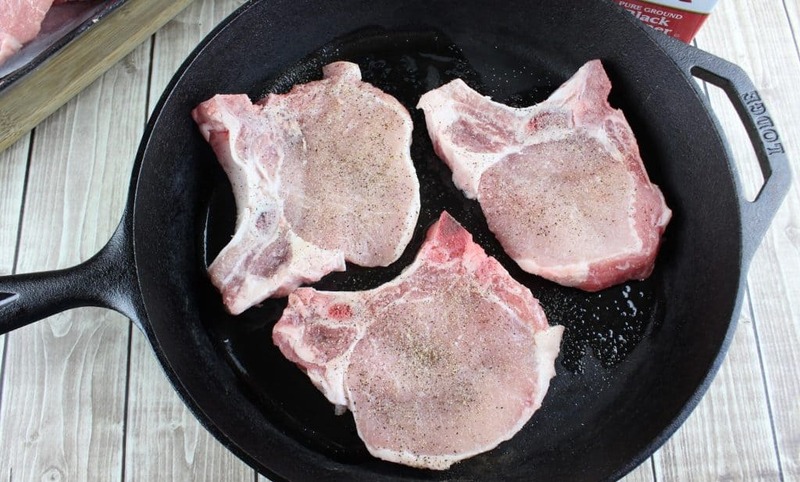 In a large skillet over medium-high heat, brown pork chops on both sides in hot oil. 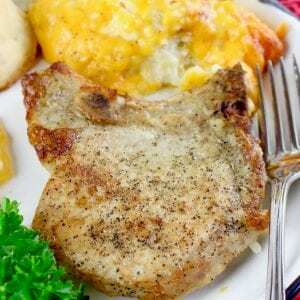 Be sure not to cook pork chops all the way through, they will finish cooking in the oven. In a large bowl, combine sour cream, soup and milk. Stir in hashbrowns and onion. 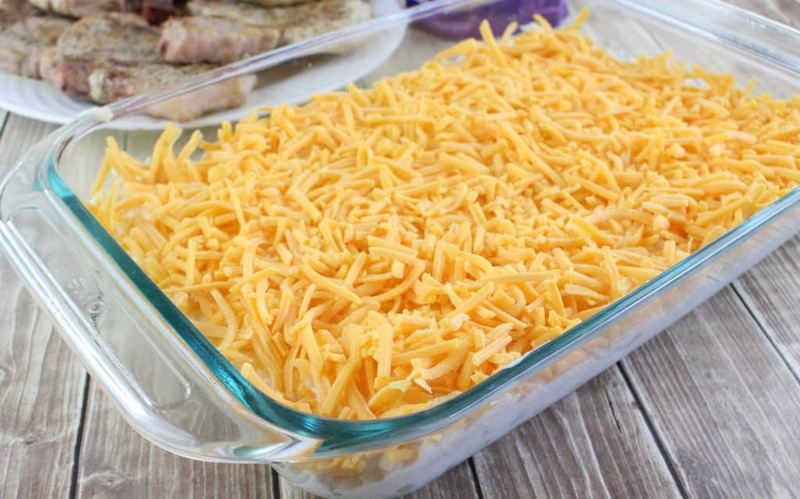 Spread hash brown mixture in an ungreased 13 x 9 baking dish and sprinkle with cheese. 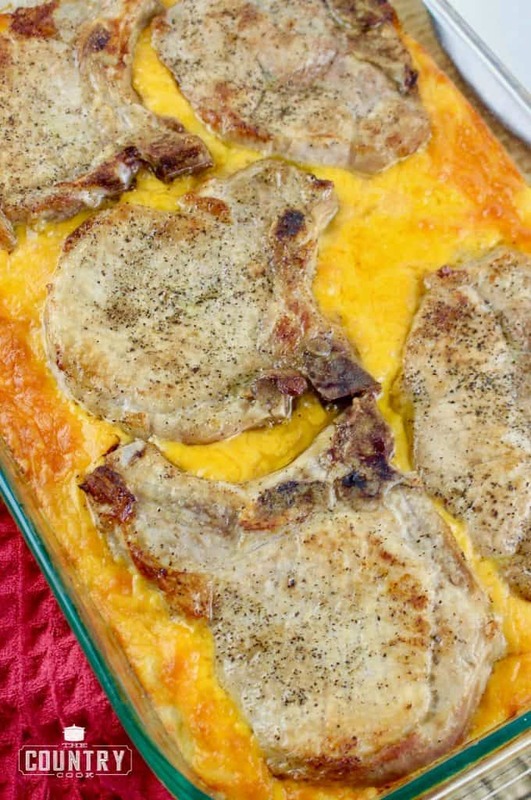 I would not recommend using thin cut pork chops for this recipe since the longer baking time may cause them to become dry. Hi Michelle!! So glad to hear this was a success – yay! I made this last night. 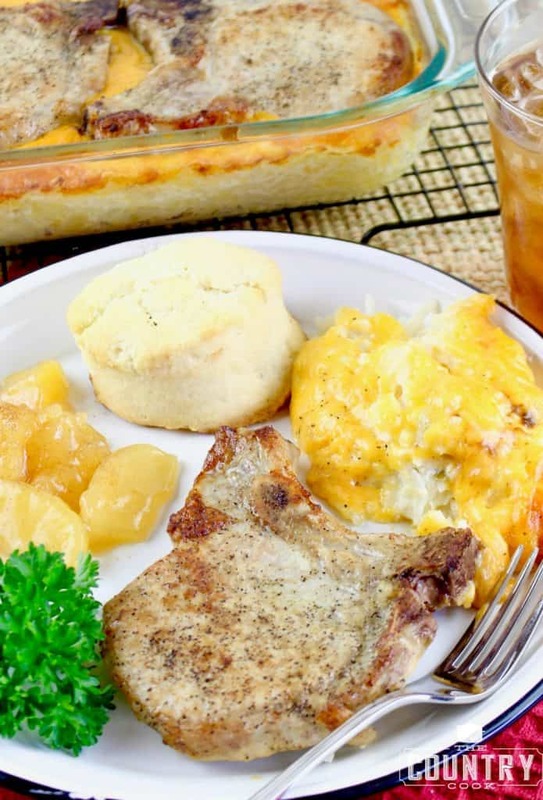 I substituted thick pork cutlets for the bone-in pork chops and used southwest style hash browns and omitted the onion. It was delicious! Thank you for sharing the recipe. 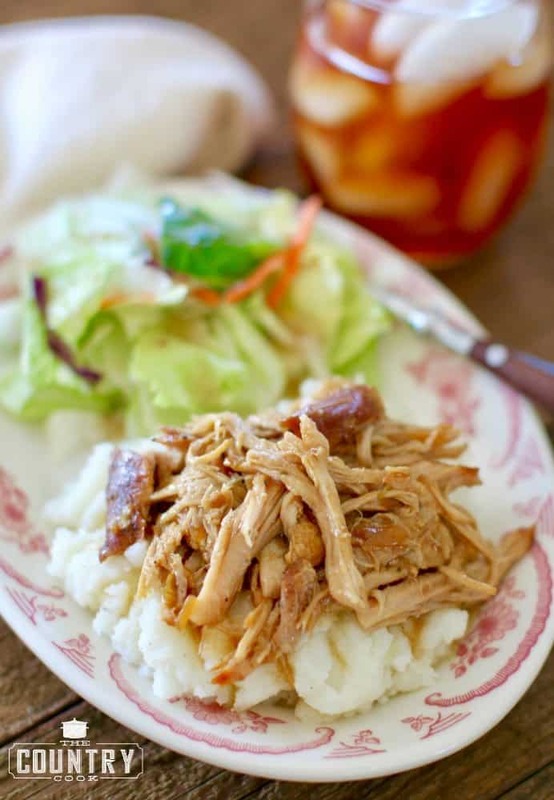 Here is a similar recipe for the crockpot. (An added bonus is the french-fried onions others have commented on). I found it in a Taste of Home magazine. It was submitted by Dawn Huizinga from Owatonna, Minnesota. *In a large skillet, brown chops in oil on both sides; set aside and keep warm. In a bowl, combine the potatoes, 1 cup cheese, soup, milk, sour cream, seasoned salt, and pepper. Stir in half of the onions. 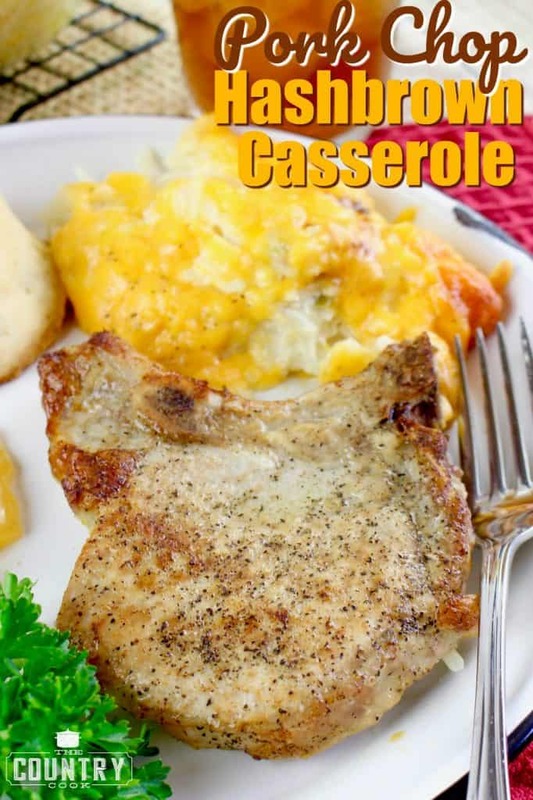 *Transfer to a greased 5 quart slow cooker; top with pork chops. Cover and cook on high for 2.5 to 3hours or until meat juices run clear. Sprinkle with remaining cheese and onions. Cover and cook 10 minutes longer or until cheese is melted. Enjoy. Incidentally, the Gooseberry Patch recipe you posted for this came from a woman living in Wooster, Ohio. I live 30 minutes from there. I just found your blog and I'm loving it. I have spent all day looking at your recipes instead of doing my homework. I have found many recipes that I want to try. Best wishes to you, your family, and your scrumptious (my 8 year old just used this word last night) blog. I made your crock pot recipe last night but I only made 3 pork chops because I was serving only 2 of us and I cut the hash browns down to half a package. I also used Healthy Request Cream of Celery soup because it is low sodium and has no MSG which will put me in the hospital as I am highly allergic to it. I didn’t used the french fried onions but used a small red onion finally diced that I combined in the soup mixture. It turned out so very good. Thanks for all of the notes and the change up in the recipe. .
My husband refuses to eat anything with cream of celery or mushroom.. He is a cream of chicken guy… What do you think about substituting the cream of celery for the chicken… Think it would still be as good??? I was just wondering if it matters if you use boneless or bone-in chops?? Thanks!! Sounds delish!! 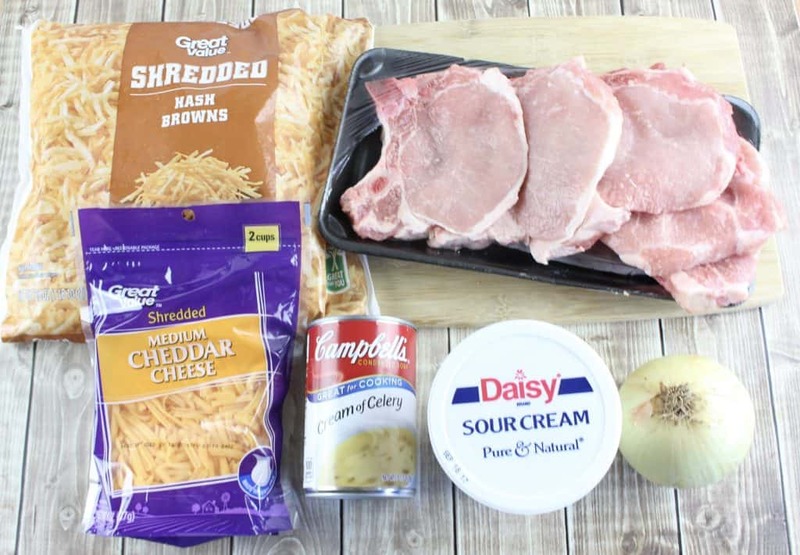 I used thick boneless pork chops and it was fantastic and done in 1hr. Love the simplicity of this yummy recipe! I just made this for dinner the other night and both my husband and 2 year old daughter loved it! Good call on seasoning the pork chops, I sprinkled a little salt, pepper and a dash of Cajun seasoning on both sides of the pork chops. Will definitely being making this again! Nice change from the usual porkchop recipes. I followed another post which suggested adding French Fried Onions. Excellent addition. The last few minutes I added more cheddar cheese and FFOnions on top of the chops. Will definitely make this recipe again. Thank you for the recipe. My hisband hates sour cream, could you leave it out and it still taste good? I want to make this so bad. I have had this recipe Pinned for a while. Hindsight being foresight, I don't know why I waited this long to make it! Was YUMMY! I followed the directions as written. With the exception of seasoning the pork chops. A keeper! Next time, will HAVE to make two pans! TY for sharing. 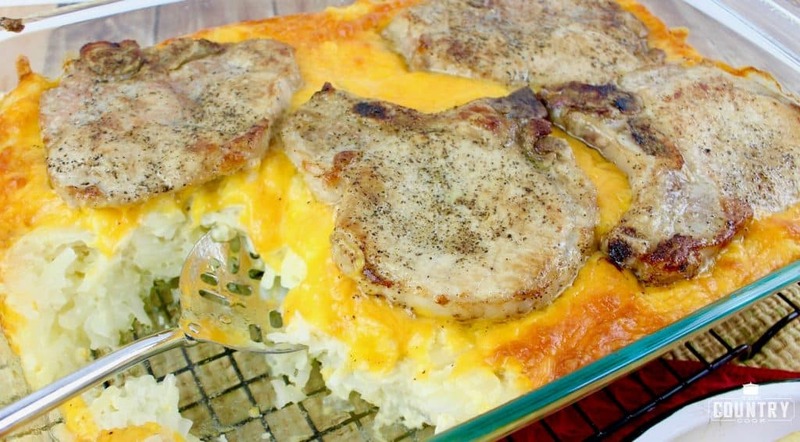 This casserole was simple to put together, but even better than that, my family loved it! Not a drop of leftovers! I used 6 boneless pork chops and it came out wonderfully! My son and Hubs went back for seconds! I served it with some steamed broccoli on the side. Thank you for such a lovely recipe! This recipe is even better with I can of Durkees onions. Add half can to the potatoes with cheese and soup. During last 5 minutes of baking, top casserole with the other half of the can of Durkees onions and bake uncovered.